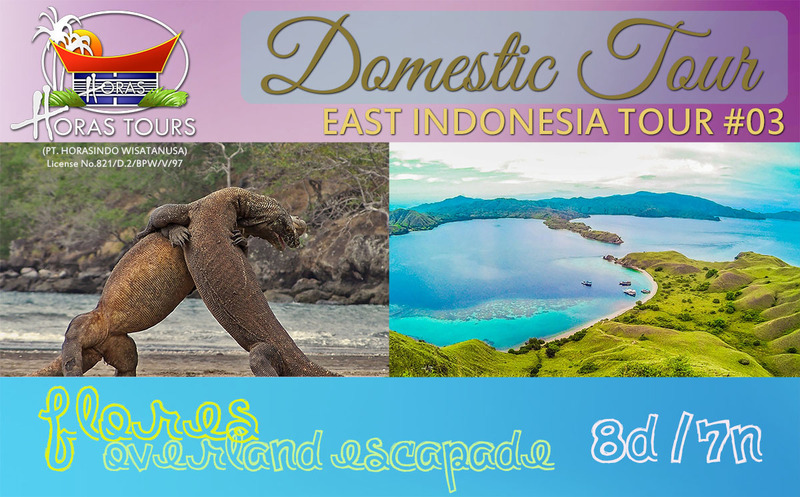 East Indonesia Package 3 Duration: 8D-7N "No blackout dates" FLORES OVERLAND ESCAPADE What better way to bask in the rich beauty of Flores than to feast your eyes as you travel overland through the island? We serve you the magical sights of Flores from the wondrous Komodo Island all the way to scenic townset of Ruteng, forested-volcanic land of Bajawa, panoramic land of Ende, captivating Lake Kelimutu, and gateway city of Maumere. Get the complete experience and enjoy the best of Flores like you’ve never seen before! Day 01: WELCOME TO SUMBA Bima – Sape – Komodo Upon arrival at Bima airport in Sumbawa, our guide will pick you up and bring you to Sape harbor for departure to Komodo Island by boat. You will overnight on the boat. Day 02: KOMODO ISLAND – NEW7WONDERS OF NATURE Komodo Island - Labuan Bajo After breakfast, we begin Komodo Island exploration on foot and observe the impressive Komodo Dragons in their habitat. You may also encounter other wildlife such as water buffaloes, birds, pigs and deer. On the way back, we’ll stroll by the dry river path to see the stunning landscape and proceed to sail to Labuan Bajo by midday. Check in to hotel at Labuan Bajo and enjoy your free time. Day 03: EN ROUTE TO RUTENG Labuan Bajo – Ruteng After breakfast, we will overland by car for approximately 4 hours to Ruteng so sit back and feast your eyes on the beautiful rice terrace, jungle and savannah as we go through the mountainous route. There will be plenty of photo stop along the way, so make sure you have your camera ready ;). Day 04: SIGHTSEEING DRIVE TO BAJAWA Ruteng – Bajawa Today, we will take you on a relaxing sightseeing journey and village excursion as we en route to Bajawa (around 4 hour-drive). Along the way, you will be greeted by the sight of green coffee plantation, lush tropical forest over volcanic mountain, wonderful rice terrace and flowers. We will stop by Bena traditional village, centuries-years-old village of ancient of mountain tribe from Bajawa. Check in at Bajawa hotel. Day 05: EN ROUTE TO ENDE Bajawa - Ende After breakfast, get ready to hop on for another 4-hour drive to Ende. Enjoy the sceneries as we drive up and down the rolling green hills, passing by the striking beach view all the way to Ende. En route, we will visit and watch the fascinating process of traditional palm wine (Moke). Check in at Ende hotel and free leisure time at your own. Day 06: LAKE KELIMUTU EXCURSION Ende – Kelimutu - Maumere Take an early breakfast as we’ll be heading out early morning to see the tri-colored Lake Kelimutu. The crater lakes have changed color over the years, and presently the lake color is black-brown, green, green-red color. As you view this natural phenomenon, our guide will fill you in on the interesting myths of the lake as believed by locals. Afterwards, we will head down to Wolowaru traditional house/ Jopu village. Return to hotel at Maumere. Day 07: FREE FULL-DAY AT MAUMERE Maumere Today will be a full day for you enjoy your own activities. Relax at the hotel or roam around the town to see the day-to-day life in Maumere. If you enjoy the beach, Maumere has the perfect clear blue watered beach backed with the green hills for you to explore. Day 08: SEE YOU AGAIN Maumere – Airport After breakfast, our guide will transfer you to the airport for your flight departure to the next destination.